Expanding to accommodate a growing family. 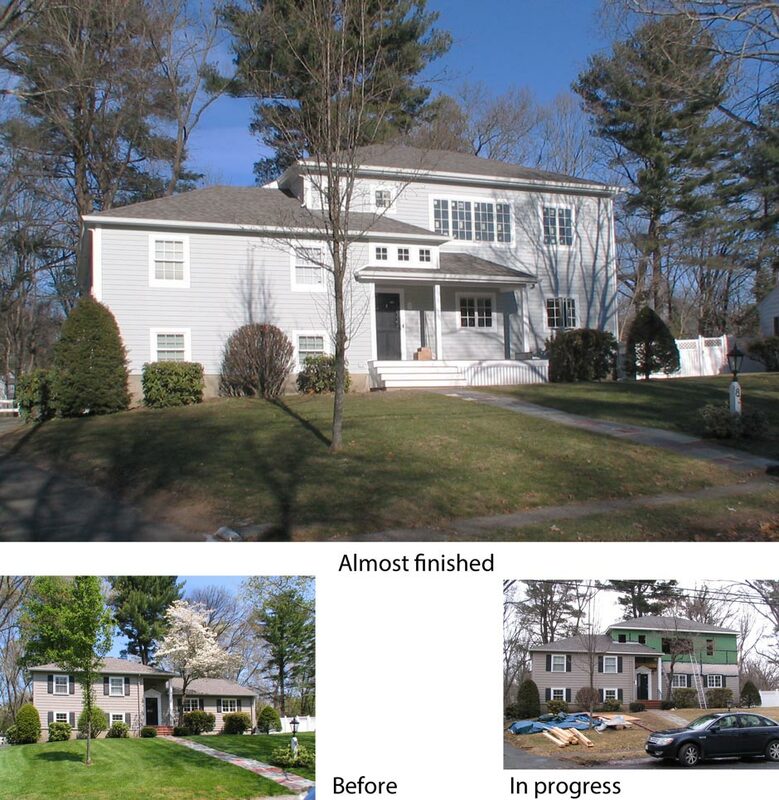 My clients’ existing split-level home with colonial details had a 2-car garage, home office, and bath on the lower level, the kitchen, dining, and living areas on main level, and 3 bedrooms with 2 baths on upper level. Built in 1960, it had been well maintained, and has a nice private, though steeply sloped, back yard. WDS|A designed a master suite and home office space in a new 2nd floor above the existing main living level of the house. The new 2nd floor office space at the front of the house provides more natural light that the clients wanted, and allowed the lower level office space to be converted to a suite for a live-in caregiver. Windows in the new home office space, almost done. Rear view from below in back yard, in progress and almost done. At the back of the main level an existing screened porch off of the dining area was replaced with a sunroom with sliding doors opening onto the new decks overlooking the steeply slopping back yard. New French doors bring more light from the sunroom into the dining area. 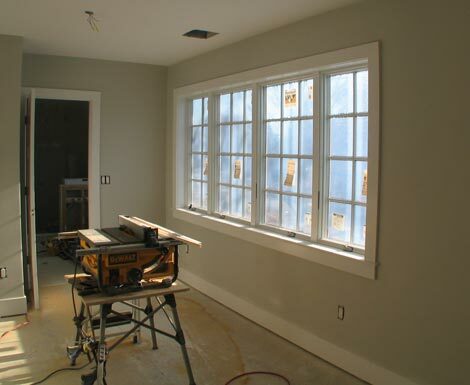 The existing living room picture window was replaced with sliding doors for access to the new decks as well. At the front of the house a larger entry porch was created to provide a sitting area and balance the larger new volume of the house. Small square windows in the top of the tall porch space were designed to allow more natural light to reach the front door in the day time, while a hanging lantern fixture creates a warm glow after dark. 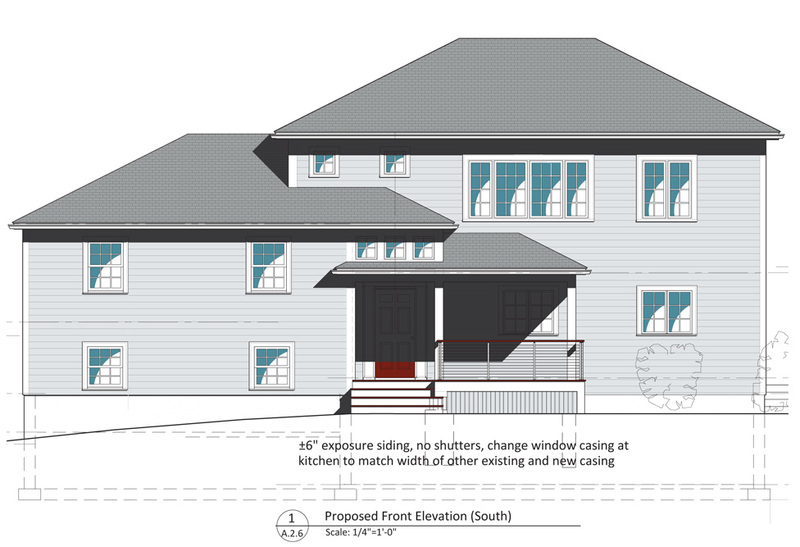 Both the new front porch and the back decks will have cable style railings and guards for a contemporary look. Study drawing for colors and finishes featuring cable rail.